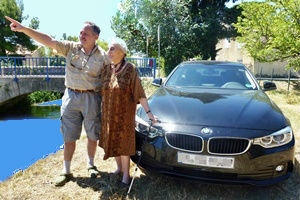 A La Carte Europe Tours organizes custom-made guided and chauffeured tours for small groups and individuals wishing to discover Europe in the best possible way. Although all our tours are custom-made and you are free to choose whatever standards you require, we usually suggest standard chauffeured itineraries of impeccable quality: 3-5 star accommodation, all meals included, dinners in fine cuisine restaurants, all entrance fees, tolls and taxes included. To the contrary of almost all other tours offered, our chauffeured tours usually include everything with the only exception being personal expenses. As we travel in a small, guided group - usually a couple or up to 6 friends traveling together - we take full advantage of the time available and your expense is fully justified. There is no need to wait 15 minutes until everyone has left or joined the bus, as we travel exclusively in private chauffeured vehicles - large sedans, limousines or minivans. There is also no need to be accommodated in large, faceless hotels, the only quality of which is to offer a large quantity of rooms. As a small group, we can enjoy fine, picturesque hotels in converted mediaeval castles or private estates, allowing the tourist to get to know and experience Europe in the best possible way. All in all, a small group and private tour allows the tourist to see much more - probably twice as much - as a large group tour. Not to mention the comfort and convenience of having your personal guide always at hand, ready to assist you with a difficult staircase, a menu in a foreign language or aspects of human and natural history of Europe. Whatever your chosen itinerary and formula, you can be assured that we will look after you from the beginning to the end of your chauffeured tour in Europe to ensure that you have an unforgettable travel experience.